Adam my running trainer is snowed into his village, so no running training this morning. But I’m not one to give in easily, I said I’d go for a long run instead. ‘Enjoy your LSD’ texted back Adam. I think we have generational crossed wires here. For Sports Rehab lecturer and trainer, Adam, LSD means Long Slow Distance, that stamina-building fitness you develop from clocking up the miles. For me, who knows people who called their dog Hofmann, LSD automatically conjures up images of Timothy Leary and hippies. Infantile smirking to one side, I set off this morning into a foggy world dusted with snow, underneath which was ice. I decided to run down by the river and headed towards Sale before footpath closures forced me round the back of a golf course and past endless kennels places until I found myself about a mile from Chorlton water park. I looped round that, trotted round the tracks and woods for a bit and then headed home. There was a moment, about half an hour in, when I was contemplating the pleasure of being completely alone. Snow muffles sound, so I felt completely isolated from everyone else who might be about. Time to think your own thoughts, undisturbed, for an hour and a half. It is a rare treat. Running in snow it damned hard work though. I was about a minute a mile slower and so completed eight miles in 143 minutes. I did 136 earlier in the week. Somehow, between mile seven and eight I got a push of energy back and I was off like a whippet again, but six to seven was pretty tortuous. Why does that happen? My last mile is always faster than the one before. Is it psychological? Any insights welcome. What I know for sure is the pleasure of pouring myself into a hot bath on my return. That moment when your aching chilled flesh submerges into hot water… almost worth freezing your arse off for that moment. A large glass of cherry juice and a big bowl of porridge and I feel almost human now poached pink again. And I feel very alive, which is just one of the joys of being a runner. And it is about time too. I have been promising myself new running shoes for the past three months. My old ones have felt like lumps of lead on my feet for ages. 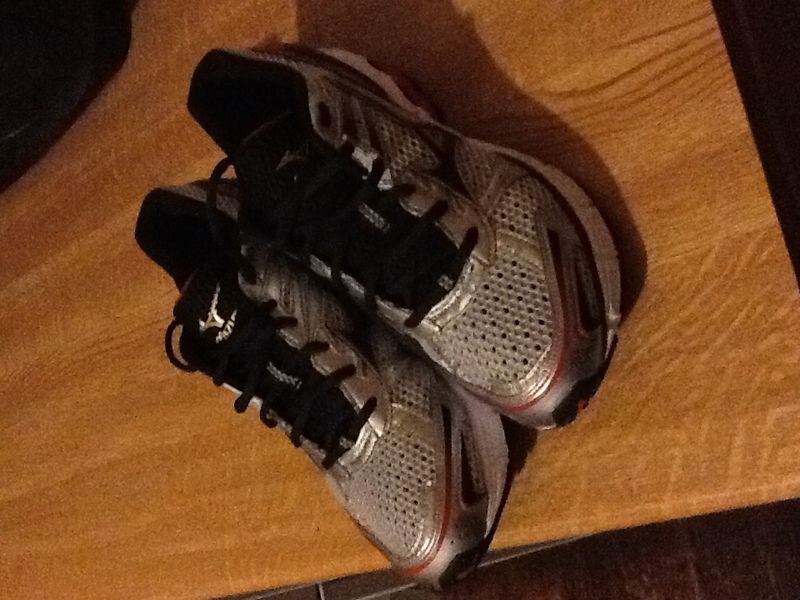 This afternoon I shunned sofa lolling for shopping and I am now the proud owner of a pair of mizuno wave inspires. They are for people who roll in a bit when they run and they are as light as a feather. I did the whole treadmill test thing where they video the back of your feet and you get so see how fat your ankles are from behind – in slow motion. Lovely. But you are supposed to be paying attention to how your feet roll when you hit the treadmill and these shoes pretty much stop that for me. I was so impressed with the difference I forgot to check whether they made my ankles look slimmer. Needless to say I am desperate to get out there and test-run them. Oh, quick aside: the chap who helped me pick my shoes goes for sports massages several times a week. i can only think that he is some sort of elite athlete, or a masochist. We all have our crosses to bear as runners. Some of us are prone to shin splints, some of us struggle with our achilles heel. Imagine your achilles heel being your achilles heel… but I digress. Mine is this little mouthful – and, no I can’t pronounce it. Iliotibial Band Syndrome is its fancy name. But mine’s not caused by over training, it’s caused by having one leg longer than the other. Significantly longer than the other. Although it has an effect on the outer thigh I was having trouble with muscles over-compensating for the tightness and so I kept getting a pain on the inside of my thigh that would kick in periodically when I was walking. It was a bit like someone having a crochet hook inside your muscle and yanking it and I had had enough. After a few months of being halted in my tracks I abandoned my ‘let’s not fuss, shall we’ stance and I went to a sports and spinal injury clinic to get it sorted out. What happened next was several weeks of sports masage on said thigh and hip where the muscles were now as tight as a violin string, which was all sore as hell and I used to ponder why I was paying someone £17 a week to lean into my thigh muscles with his elbow. He also gave me a load of exercises to do to strengthen supporting muscles which were about as much fun as cleaning the bathroom. But it all worked. Of course I’m aware of the problem now, pack in yoga classes where I can and bear in mind that just because I can touch my toes that doesn’t mean every muscle in my body is stretched, relaxed and happy with my running. So my advice would be on niggling injuries; get them sorted. And anyone can run, even a lop-sided slow-coach like me.